Laura McAreavey has never been much of a risk-taker. As POET’s Treasury Manager, McAreavey is responsible for creating and implementing a formal treasury function while managing relationships to increase return on POET’s cash reserves. Risk taking isn’t really in McAreavey’s job description. Her conservative, conscientious approach to work has served her well over the 15 years she’s been with POET. It never occurred to her that taking a few chances every now and then could help her professionally. Today, McAreavey sees things a little differently. POET believes continual workforce development is an important characteristic of a successful company. Spark was introduced to support this belief. 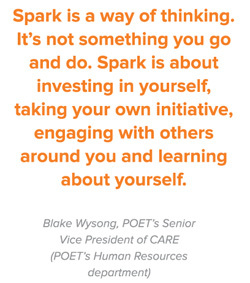 It’s a very different approach to traditional workforce development or career development, says Blake Wysong, POET’s Senior Vice President of CARE (POET’s Human Resources department). That is, it’s not intended to train people how to do the nitty gritty details of their particular job better. It’s more about growth as a person. Leaders, after all, aren’t defined by their position in a company. Just because someone is in a position where people report to them, doesn’t necessarily make them a leader. “It’s not about titles or responsibilities,” says POET President and COO Jeff Lautt. Leaders are not born. They’re made. And they are found everywhere – both inside and outside of the boardroom. Spark extends beyond POET’s walls, too. For McAreavey, that meant joining Toastmasters . “I hate public speaking , so I joined Toastmasters to challenge myself,” she says. “Now, I’ve gotten up to do presentations, and I have the confidence and the skillset to do it.” And learning to be a leader isn’t about attending some two-day leadership seminar, McAreavey continues. “You might leave feeling inspired, but when you get back to your desk, there’s a growing pile of work and about 400 unread emails.” Work, of course, takes precedence. What was learned in the classroom quickly gets forgotten. With Spark, learning to be a leader is more self-directed and about experiences. “This is a way of life. We want to see people grow and flourish and become true leaders in all aspects of their lives,” says Lautt. There are several ways people are learning and growing at POET every day. In some cases, teams of people are working through John Maxwell’s Five Levels of Leadership, DiSC or Situational Leadership. Others are working through specialized personal development experiences, like McAreavey.